In this post, we will give you some tips and recommendations to help you use Flitto. If you have never heard about Flitto or have not signed up with them yet, we recommend you to read our post that introduces this free to join translation platform that pays you for translating. If you want to read an introduction about Flitto, please click here. 1.) When I started using Flitto, the first thing I wanted was to become a verified Flitto translator (in Flitto it’s called a Profesional Translator). After I applied and obtained this status in a pair of languages, I started to work in the Translation section. In the Crowdsource section, when somebody submits a requirement for a translation, that person has the final word on who they choose as having the best translation. Flitto only pays for the translation that has been chosen. Now, even thou the person who submitted the requirement decides who gets paid, Flitto influences the election. How? We have observed in our time using the platform that about 80% of people that have submitted a request for translation, choose the translation that Flitto positions up higher. Flitto organizes the translations that are uploaded considering three basic parameters: time, verified translators and number of recommendations. The most important are the number of recommendations: who has the higher number is placed higher. Then a verified translator is placed higher than a non-verified. And the time aspect has to do with; who submits the translations first, is placed higher. Before I was a verified translator, it was very difficult to be chosen. But after I had been verified, it still continued to be difficult because of the number of verified translators. Generally, who wins is the verified translator with an acceptable translation that has submitted his work first. A very elaborate translation will be left behind because there are a lot of other translations submitted first. It is very important to receive the first or second recommendation, because all the other recommendations will come when that occurs. So, in this section, you could end up doing a lot of translations and not being paid for any of them. Wrapping it all up, if you apply to become a verified translator and are not approved, do not feel upset. I personally think working in the Crowdsource section can exhaust you and not leave you much payment. 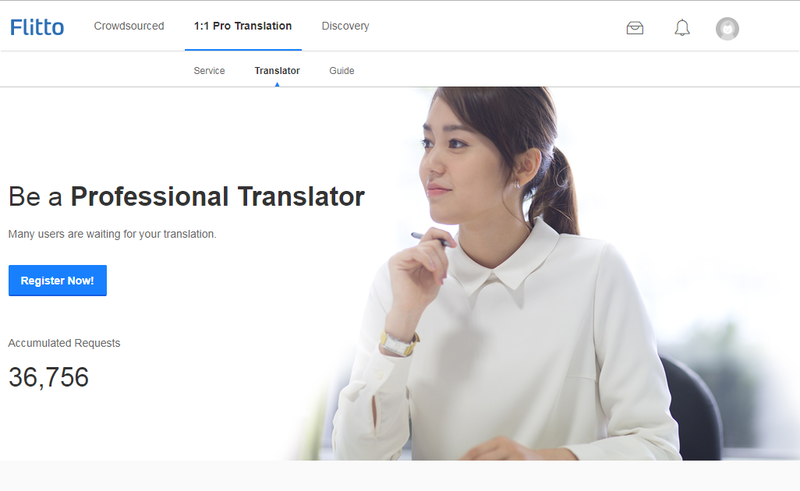 A verified translator, can also receive requests in the 1:1 Pro Translation. In our experience, you have to be constantly checking you smartphone with the app. Because if you read the requirement 2 – 3 hours later, chances are that it has already been assigned to another Profesional Translator. Here it depends on your life stile. If you have a lot of time, and can constantly be checking your smartphone, then the 1:1 Pro Translation will give you translation work. But if you can only enter Flitto at a set time in the day, then maybe this section is not for you. Once again, if you apply to become a verified translator and are not approved, do not feel upset. The benefits of a verified translator in this platform are not so tangible. 2.) Flitto is an excellent resource for doing things you would normally do outside the platform. In the Discovery section you will find an interesting way to earn a few buck. And it is not tied to getting an answer back quickly. When ever you have a chance, you can go to Discovery, translate a few sentences and then go out again. I personally like to read the news, and I do that daily. But if I go to Twitter and read the accounts of CNN, FoxNews or POTUS, besides getting updated with the latest news, I do not gain anything else. Reading these accounts in Flitto permits me also to earn some bucks doing things I like to do and would normally do even thou Flitto did not exist. 3.) Every three to four months Flitto launches an Event. In these Events, verified and non verified translators can participate alike. And the tasks are very easy and pay ten times more than translations in the Discovery section. So I personally recommend keeping an eye on them. Flitto events can come in two forms. Flitto can give you sentences to be translated. Or they may ask you to record your voice reading sentences. For events where you must translate sentences, you have to be very careful with spelling and punctuation marks. You must be aware that if less than 60% of your translations are approved, you immediately are removed from the event. You can not use automatic translators because they will get you banned from the event. You can participate using your smartphone or on the website platform. For events where you are asked to record your voice, you must also be careful with the quality of the files you record. When you are participating in this type of event you must record in a silent room. Forget recording in the streets or in noisy environments. The length of the recording is short because it generally is only one sentence. There is no problem if you have an unpredicted interruption while recording because you can always record the same sentence again and you only submit your file when you are satisfied with the results. You can only participate in recording events using your smartphone. Participating in events is a great way to earn a few dollars. It is fun, it is easy, and it maintains you in contact with your second language. I personally recommend you to jump into an event when ever Flitto opens one. So, if you have any questions about using the platform, feel free to leave them in the box below. If it is in our reach, and we have had experience in the area that you’re asking about, we will be very happy to help you out. Also, if you have any personal experience using the platform, please share it with us. We would love to hear about you and your practical contact with Flitto. First I want to tell you that I admire people who speak many languages like you. Learning Italian Online with you will be a pleasure for me. My mother is Italian, and the truth is that I speak very little Italian. I love your site, excellent content. I hope to start as soon as possible. Thank you very much from Argentina.